We are proud to present in collaboration with Out Hudson the second installment of Drag Queen Story Hour, Saturday, November 18 from 11am-Noon. Drag Queen Story Hour is just what it sounds like – drag queens reading stories to children. This is a family-friendly and inclusive event with Ella Ghent, a local drag performer. There will be stories, activities, snacks and fabulousness! 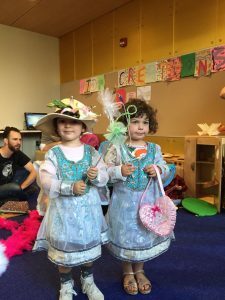 Capturing the imagination and play of the gender fluidity of childhood this story hour gives kids glamorous, positive, and unabashedly queer role models. In spaces like this, kids are able to see people who defy rigid gender restrictions and imagine a world where people can present as they wish, where dress up is real. Ella Ghent will be reading stories, accompanied with a ukulele, that celebrate diversity, self expression and creativity. There will be also be a drag treasure chest with costumes for kids and complimentary cookies from Trixie’s Oven.